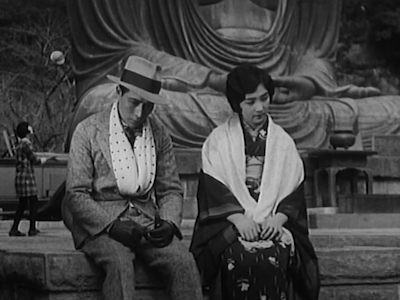 Made well into the first phase of his career, Yasujiro Ozu’s Walk Cheerfully is a facile drama, of both the crime and melo- variety, proving the Japanese director could have easily plowed his way through the Hollywood studio system, but that his true calling was always the family stories that later became his raison d’être. Released in 1930, this silent film follows a crook named Kenji (Minoru Takada), a dual personality, both a loyal friend and a deadly opponent, hence his nickname Ken the Knife. 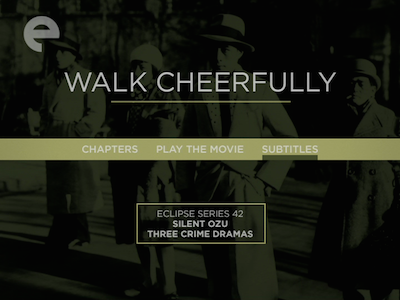 Walk Cheerfully opens with a fake-out, as Ken steps in to help when a pickpocket is being chased down by an angry mob. Seemingly an average citizen doing his civic duty, the truth is that the fleeing thief is Ken’s buddy Senko (Hisao Yoshitani). But appearances are important in Walk Cheerfully, be it the projection of a straight image or the trappings of a tough guy. In a nod to the American gangster movies he was emulating, Ozu casts the crooks in his movie as performers, complete with choreographed dance routines and Hollywood memorabilia. A carefully placed poster of Clara Bow with boxing gloves decorates their training area--an image to aspire to and also an object of desire. Interestingly, this distinction of bad guys as poseurs serves to erase the lines distinguishing hoodlum and common man. Later in the film, Ken’s innocent love interest, Yasue (Hiroko Kawasaki, Ornamental Hairpin [review]), laments that all of her office co-workers, regardless of gender, operate no differently than the criminals that roam the streets. Ironic, then, that she fails to see the truth about Ken, and refuses to believe it until she sees his gangster tattoo. Yet, if being good or bad is matter of behavior and class, than even “the Knife” can turn things around. Ken has enough affection for Yasue that he goes legit, and gets a job washing windows--symbolically erasing the dirt and exposing the view to the clear skies beyond. It’s a task easier said than done when former associates come calling, looking to lure him into one last score, but then, what separates Ken from the rest is his ability to live as who he desires to be, and not just pretend. He can use performance for good, too, hence his comedic pantomime for Yasue and her little sister on their Sunday picnic. 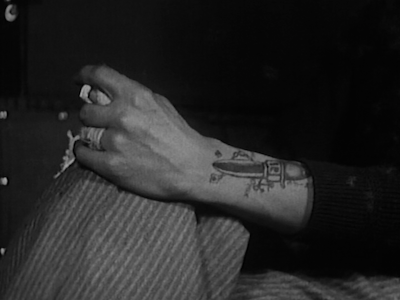 Ozu uses other visual cues--beyond dance and tattoos and clean windows--to bring his criminal underworld to life. When plotting and scheming, his characters are prone to nervous foot tapping. Gesture and slang are things you learn in your role as a tough guy. And when Kenji busts in on Yasue in a hotel room with her licentious boss (Takeshi Sakamoto, There Was a Father [review]; Every-night Dreams [review]), the appearance of impropriety is represented by the booze and smoking cigarette left on the table--and the discarded garment beneath it. 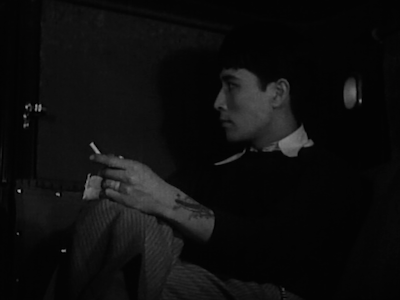 Just moments before, Kenji shows anger at being a potential cuckold by mashing a cigarette between his fingers, at once a gesture of his own impotence and the castration of his rival. Though known best for the emotion he keeps in reserve, the things not said, Ozu manages to find potent ways to express these more scandalous feelings without going overboard. Walk Cheerfully offers a satisfying mix of typical cinematic moralizing and a more genuine third act, with both Kenji and Senko putting the effort into their rehabilitation. They aren’t transformed into saints over night, and even do their bid in jail. The movie also offers us a credible heroine in Yasue. She is not just a doting girlfriend, but a responsible and productive sister and daughter, working to earn for her family, and loyal to a fault. This saves Ozu from the sort of tacked-on messaging that his American contemporaries would suffer under the Production Code, even while still maintaining his usual optimism. Like the film noir to come, crime in Walk Cheerfully does not pay, but neither does it doom the criminal to an inescapable fate. On the contrary, we have here a movie that suggests once you’ve actually settled the bill, it’s quite possible to move on to a whole other kind of payoff. 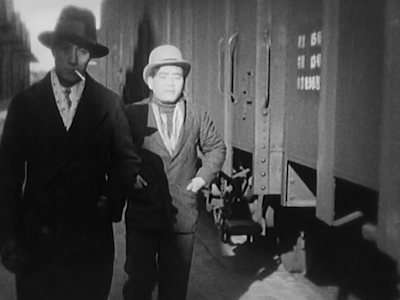 Other selections from the Eclipse boxed set Silent Ozu - Three Crime Dramas are reviewed here: That Night's Wife and Dragnet Girl.